A duotone is the use of an additional color to increase the tonal range of a grayscale image--a printing press can only produce around 50 shades of color per ink, even though your computer can generate a grayscale reproduction of up to 256 levels of gray. Traditionally, duotones are printed with a black ink and a gray ink--black reproducing the darker tones of an image, and gray ink the mid and lighter tones. However, duotones are more usually printed using a colored ink for highlight areas. This can give a significant increase to the dynamic range of an image. Strictly speaking, the use of two different colored inks--as distinct from two shades of the same color ink--is called a "duplex halftone," but "duotone" is now the common vernacular. An even greater tonal range can be achieved using three inks ("tritone"), or even four inks ("quadtone"). Photoshop provides a powerful duotone feature that allows you to define two (or even three or four) colors for an image without having to create a separate channel--thus without increasing the file size of the image. Photoshop's duotone feature is ideal for using Mountain High Maps for a print job in which only spot color is available. It is also the best way to apply a process color to a map, or a specific "spot" color such as one from the Pantone® Matching System, before changing the mode to RGB color. Select "Duotone..." from the "Mode" menu. In the dialog box which opens, select "Duotone" from the "Type" pop-up menu. Specify your second color by clicking in the solid square for that ink. Use the color picker or the Custom Colors option to choose your ink color. Click "OK" and then name the color in the panel alongside its swatch. IMPORTANT: if you specify a PANTONE color, and will eventually be using another application--such as older versions of QuarkXPress or PageMaker--to output your image, make sure that you define the color in that application using EXACTLY the same name that you have used for it in Photoshop, However, most applications now import PANTONE colors successfully from other applications, regardless of how they are named. If one of your duotone inks is black, the printed result may be too dark. You can compensate for this by adjusting the duotone "curves." Click on the curve box (the box with the diagonal line) to the left of the swatch. The "Duotone Curve" dialog box appears. Adjust the duotone curve either by clicking on the graph and dragging, or by entering percentage values in the appropriate boxes. Or you can load a previously saved curve--a set of duotone curves is supplied with your Photoshop application. Use the "Duotone" feature of Photoshop to apply spot colors to a grayscale map. 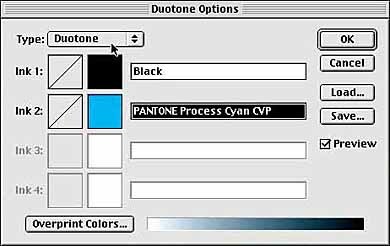 The Duotone feature is also useful if you wish to assign a precise PANTONE color to a grayscale map, which can then be used for print output either as it is (saved in EPS format) for spot color printing, or converted to CMYK mode for four-color process printing. If you want to view the individual channels of a duotone, choose "Multichannel" from the "Mode" menu. This enables you to view the individual printing plates by clicking on the appropriate channel in the "Channels" palette. To switch back to duotone mode, simply select "Undo" from the "Edit" menu. If you intend outputting your map from QuarkXPress, save it as an EPS file with the "Binary" encoding option checked.